Fulham Court Shooting a Revenge Attack? Rupert Ross, 29, of Vera Road in Fulham, will appear at South Western Magistrates' Court on Friday November 12 charged with the murder of 20 year-old Darcy Austin-Bruce. Darcy, who lived in the Fulham Court estate was shot dead in Heathfield Road outside Wandsworth Prison on May 1 last year. Police were called at 2.30pm on May 1 following reports of a man being shot and two men wearing crash helmets fleeing the scene on a scooter. A post mortem established that Darcy, who had been visiting the prison, died of multiple gunshots to the torso. The murder was investigated by officers from Operation Trident, which focuses on gun crime in the black communities. Within a week, six men had been arrested. The case took a further twist when just a few hours after his funeral on June 4, a neighbour of Darcy's, Anthony Otton aged 20 was shot dead as he left his flat in Fulham Court. At the time, police suspected this shooting was a revenge attack for Darcy's murder. In February this year, ten months after Darcy's murder, police handed out leaflets in the area of Fulham where he was believed to have contacts, and his family made an emotional appeal for anyone with information about the death of their "beautiful son, brother and friend" to come forward. 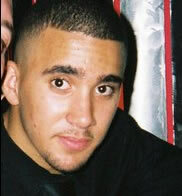 The faily said: " Our son Darcy Austin-Bruce was brutally murdered in cold blood outside Wandsworth prison. Darcy was a loving kind generous and thoughtful young man who always made us laugh and smile. You never expect these terrible things to happen to you or someone in your family, but it does and it is devastating. And as a family we are just existing. Every day the pain is as fresh as the day he was first taken from us.
" No parent should see their child lying in a mortuary, or see and feel the bullets holes in his lifeless body, a life that was taken away by an evil monster and his accomplices.
" Darcy was our world. We are a very loving family and Darcy's murder leaves us with such a void of unimaginable magnitude.
" Please help us to get justice for our child and for his sisters, who have now lost their only brother. Anyone out there, mothers, fathers, children, friends who have any information no matter how small, please, please feel our pain and help us. This has destroyed our family." Anyone who has further information about the case is asked to call the Trident incident room on 020 8247 4554 or call Crimestoppers anonymously on 0800 555 111.